Oh Dog! I am so excited! Today I am talking with Carey M. Theil, Executive Director of GREY2K USA. He’s going to tell us about greyhound racing and why his organization is working to end the practice. Rumpy: Thanks for being my guest today! Rumpy: What is greyhound racing anyway? Carey: Greyhound racing is a commercial industry in which thousands of dogs are used as numbers to gamble on. Rumpy: Gamble on dogs? This wasn’t even on my radar until I moved to Florida. How many dogs are we talking about? 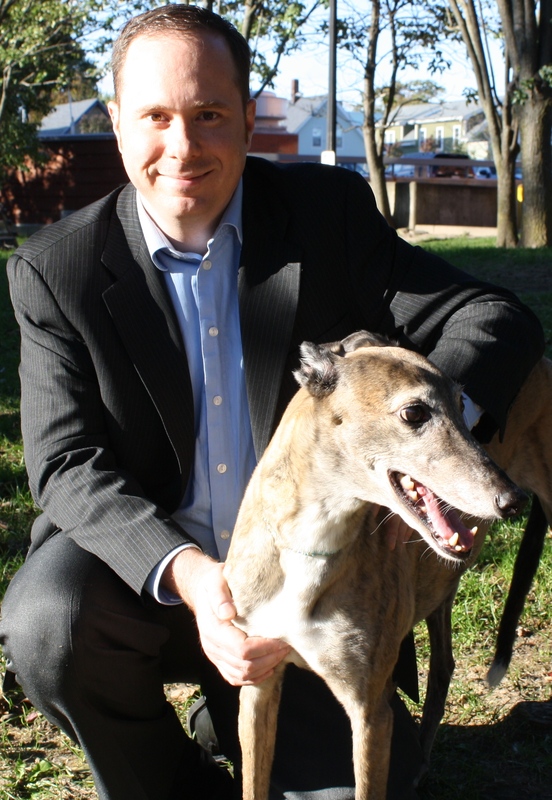 Carey: Unfortunately, we do not know exactly how many greyhounds are in the racing industry. We do know that in 2012, 10,157 greyhounds were individually registered to race for the first time nationally. We also know that the dog racing industry has estimated that there are as many as 8,000 dogs at Florida racetracks. Rumpy: Are you kidding me? That’s a lot of dogs! What’s life like for a racing dog? Carey: There are many humane problems in greyhound racing. For example, thousands of racing greyhounds dogs endure lives of confinement, kept in small cages that are barely large enough for them to stand up or turn around. Carey: Also, many greyhounds suffer serious injuries. We are opposed to greyhound racing because of industry standard practices that we believe go against mainstream values, like the system of confined housing that is used. Rumpy: I agree. That’s no way for a dog to live his or her life. So how many racetracks are we talking about? Carey: There are only 22 operational dog tracks in the entire country, and of those 13 are in Florida. Rumpy: Why are so many here? Carey: Even though these facilities are losing money, they continue to hold dog races because the law says that they must do so in order to have other forms of gambling. So these tracks have essentially become profitable poker rooms that happen to have dogs running around in circles, with no one watching the races. Rumpy: That’s ridiculous! What can humans do to help you end greyhound racing? Carey: There are many things that people can do to help greyhounds. First, they should visit our website at GREY2KUSA.org and learn about the humane issues involved with greyhound racing. Then, they should tell other people about these problems, and encourage them not to gamble at dog tracks. Rumpy: Right! Please don’t support dog racing! What else? Carey: Also, they should write to their state lawmakers and say that they are opposed to greyhound racing, and would like to see the law changed so that dog racing is outlawed. Rumpy: If you live in Florida, Alabama, Arkansas, Texas, Arizona, Iowa, or West Virgina, please write your state legislators, and ask your neighbors and friends to do so as well. Also, while there currently is no dog racing in Oregon, Connecticut, Kansas, Colorado, or Wisconsin, it’s still legal to do so. Carey: Finally, your readers should consider adopting a greyhound. They make wonderful companions! Rumpy: They are beautiful dogs! Carey: Most of these things will be more effective for people who live in a state with active dog tracks, but everyone can help. For example, homes are needed for rescued greyhounds all over the country. Rumpy: Wow! Thanks so much for being my guest today Carey Theil. Here’s hoping that Greyhound racing is soon a thing of the past! « Happy Sunday…… From Most of Us! Very thought-provoking. There is a lot of greyhound racing in Australia – but it’s always kind of sold as ‘humane’, because they say a greyhound that does it’s racing is usually too tired to do anything other than sleep in the crate anyway. As far as I know, there is no cruelty to them. But it still doesn’t sit right with me. The greyhounds I’ve met have been beautiful, loving dogs and they deserve to be in a home with loving owners. There is of course the sad issue of what happens to the greyhounds when the racing industry is ‘done’ with them. Despite the tireless work of greyhound rescue agencies, many of the dogs get put down. I don’t think any animal should be used solely for human entertainment. That’s why I don’t support circuses either. Wow, that’s definitely food for thought. I’m going to look into this further. Thanks for flagging it. I share this info wherever I can. All animal lovers can make a copy of it to share whenever this discuaaion comes up. Feel free to modify and share it with your own info, as long as the info is verifiably true. There are references to Grey2KUSA.org (because they have been under attack here in the US because of the effectiveness of their campains), and some reference to past raing industry insiders lying about facts relating to Grey racing. The more people learn of the horrid conditions of Grey racing, the easier it is to shut the tracks down. Ignoring all of the evidence proving that Greys suffer in innumerable ways at racetracks does not make any of it go away, from malnourishment (including feeding them 4D meat (the meat from dying and “downer” cows)), to debilitating injuries, to premature deaths. If ANYONE believes the Grey racing proponents here, or anywhere else, venture forth. Just a few, minimal examples are right here. Of course, these don’t fit the Greyhound Racing Association’s talking points, do they? Just so everyone reading this knows the malice and ill-will cavalierly thrown about by these imposters who pretend that track racing is good for Greys, let’s have a look at these vids and articles, and then see who the liars REALLY are, shall we? You can go online and find innumerable videos and articles on the abuse on Greyhounds at the tracks, and the thousands of Greys bred to produce a few hundred “acceptable” (read: money-making) racers. Search “Greyhound death”, “Greyhound abuse”, Greyhound torture”, “Greyhound fatality”, “Greyhound fatalities”, “Greyhound disaster”, “Greyhound accident at track”, or many more combos. Let’s start here. I can’t even watch this one, again. You can see the fear in the poor puppy’s eyes. He’s been listening to all his sisters and brothers screaming when they were tattooed, so he is already scared. His anticipatory fear simply amplifies the pain. And it only gets worse from there. So, EVERY TIME someone tells you how “innocent” Grey racing is, or how much “Greyhounds love to run,” ask them, “How much do Greyhounds love to run at racetracks?” Ask them “How much did the Greyhound looking right (in the middle of this clip from GreytExploitations.com) love hearing a racemate scream in agony, before watching it snap its neck? c	(shoot! I lost this video link-a Grey looking right when it’s racemate crashes into the wall-still looking for it.). They don’t care even if the Grey actually dies, as long as they can bury it or leave it in a ditch. (This portion is regarding the racing industry’s propoganda (lies) that Grey2KUSA.org actually makes up the numbers used to report on deaths and injuries at Grey racetracks. We are speaking directly to the racing industry, as they are keen to make up lies to make their immoral industry more palatable to moral and conscientious people.) As for Grey2KUSA.org, they ACTUALLY get the numbers directly from the tracks themselves when tracks report them to the states, as required by law in some states. So, Grey2KUSA.org’s numbers are as far from made up as your claims of the innocence of Grey racing is from the truth. As you said (as a racing supporter), when someone (you) gets their numbers from a skewed source… Do you Grey racing supporters EVER read this stuff through before posting it? My word, Swiss cheese can only DREAM of having so many holes! As for Greyhound Pets, Inc., I feel they are a great group. They have wonderful things for one particular Grey who holds the most special place in my heart. However, they are “neutral” on racing in a Faustian Bargain, because most tracks REFUSE TO ADOPT OUT TO GROUPS WHO OPENLY OPPOSE GREY RACING! Therefore, no matter how vile they find racing (and they DO find it vile! ), they agree to not speak ill of the tracks because the tracks will then go back to killing ALL the Greys, instead of adopting some out. A Faustian Bargain, definitely, but it saves thousands of Greys from the horrible deaths you otherwise give them. I have to ask, do you tear their ears off before or after you murder them? (for new readers, the Greyhound racing industry tears the ears off of the former racers before they dump them in mass graves, which may be by the roadside, because they have to remove the ears because of the identifying tattoos shown in clip number , above.). As has been seen recently, you may just cut the ears off Greyhound while still alive and dump it on the streets. There are clips of dead Greys who have had their ears torn off, as well, in the above clips, so don’t for a minute think you can call this fact a “lie”, or “propaganda”, and all the usual tactics you employ. Great interview Rumpy – I have a friend who adopted two greyhounds that were former racing dogs. They were just so sweet and gentle, not to mention – big. That was quite a few years ago and both have since gone to the bridge, but they were wonderful dogs who were fortunate enough to live with my friends, who spoiled them rotten. It’s a nice ending to a life with a sad start. But many racing dogs are not so lucky. How could you resist a look from a Greyhound. You cannot, if you have a heart. Such big, saucer eyes looking up at you, longing for a little love (but, they will settle for alot of it). Oh those poor greyhounds, I had no idea! Thanks for a great interview rumpy! M says we used to have one in our state because she went years ago. She felt so bad for the doggies.. That track has since been closed down, for which we are thankful. Check out their website Gizmo! It IS sad. Animals are not property to dispose of. We don’t have that in our state. Mom thought about adopting one years ago but with our cold weather and having to bundle up the dog for the weather she decided she needed furry dog instead. If you vacation in Florida you still are affected by dog racing. I had no clue about something like this. Dogs belong in our hearts and homes, not races! How sad… I didn’t know about these greyhound dog racing….Oh no….they are kept in such a small cage? It sounds like animal abuse….We have to stop it for those lovely greyhounds…..
Molly (my greyhound) agrees with Rumpy that dog racing needs to end…NOW. Let’s work at getting the word out. Yes, I hope they end this pathetic “sport.” The dogs suffer too much for human pleasure. We have a lot of Greyhound rescue groups here in Kansas. I see a lot of pet Greyhounds. They are great dogs. The Greyhound racing industry is not a kind one…. There’s one 45 min from here. Horrid. People don’t like to hear the stories about the pits of dead dogs on the grounds. It’s easier to hide abuse of dogs than racehorses. It’s an ugly ugly world. Please support local greyhound rescue groups – foster if you can – or be an emergency “hold home” for part of a day. Every little donations of dog food or spreading the word of dogs available for adoption helps! Great interview, Rumpy! This has to stop! Great interview Rumpy! I thought that there actually might be more than 22 greyhound tracks open for some reason. Always good to learn more about it and be informed. Thanks for sharing. I’m so grateful that Rumpy decided to cover this important issue. It’s also wonderful to see so many supportive comments here! I became aware of the how greyhounds are treated inhumanely, when I came upon a homeless greyhound mix at my local groomers. The groomer owner had taken in the dog after her owner became to ill to care for her. The groomer owner was going to take her, Pudsy, to the shelter after failing to find her a home. I said I will take her, I couldn’t bare to see her go to a shelter. After connecting my dog network of people, I found a local greyhound rescue that was willing to take her. Pudsy stayed with me for several months before going to the rescue. I fell in love with her. Greyhounds are great dogs! She fit right in with the pack I already had. I live in an apartment and very surprised to learn these accommodations were fine with her. She just wanted to cuddle. I knew she would be happier with a large yard to run in. And boy can she run! We took her to the beach several times. I learned from the greyhound rescue about the inhumane treatment of these dogs from racing. It reminds me of a puppy mill, dogs are not cared for and loved, but treated souley as a commodity to make money. Their health, welfare and happiness are of no concern, sadly. I have been a fan of greyhounds every since, they make wonderful pets! Greyhounds are beautiful dogs with a sweet personality. How awful to use dogs for racing. I am glad the greyhound racing is starting become widespread. A couple of weeks ago, I also discussed it with my peers and they were surprised with the statistics and what happens to the dogs that retire. Quite simply, I don’t believe ANYTHING Grey2K says. If you want to help Greyhounds, there are a lot of groups that tell the truth, and use the money they raise to help Greyhounds instead of paying themselves. I have been involved with Greyhounds for many years and I know a lot about this issue that you didn’t research. Sorry, but I will never support this group and their dishonest tactics. One thing I know about animal lovers is that many think that spending money on a few dogs today is the way to go. I am more of a big picture thinker. I know that while I may save a few dogs today, there will still be many more to come until there is a change in the fundamental idea of dog racing. And that must come from a change in laws. GREY2K is a lobbying organization that aims to put an end to dog racing. I support that. And if a few dogs are saved today but nothing is done to stop the problem, then you’re never going to see a solution to the problem. Sadly, the dog racing industry would prefer you spend your money on rescue rather than a change in the law. That only benefits them. Spending money with G2K only benefits them! They lie about MANY things and I suggest you do some real research on Greyhounds and racing. One dishonest source is NOT enough! Since you obviously are more knowledgable on the subject, please recommend some real research sources.